The Hall at Patriot Place presented by Raytheon honored Kelly Powers, a computer science teacher and department chair at the Advanced Math and Science Academy (AMSA) in Marlborough, Mass., as The Hall’s Massachusetts STEM (science, technology, engineering, math) Teacher of the Year at the Nov. 13 Massachusetts STEM Summit held at Gillette Stadium. 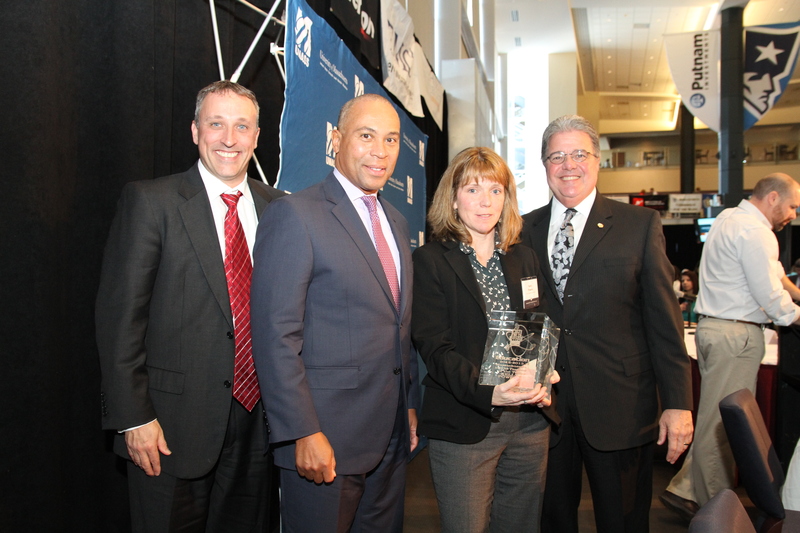 Powers was recognized by Governor Deval Patrick and University of Massachusetts President Dr. Robert Caret. The Hall’s executive director, Bryan Morry, presented Powers with a crystal trophy and a $5,000 check for AMSA to use on STEM education. Powers is the inaugural winner of this award, which recognizes a Massachusetts teacher who is making significant contributions to STEM education. The other finalists’ schools received $1,000 grants for STEM education courtesy of Raytheon. Those finalists were Hans Batra from Needham High School, Angela Cunard from Seekonk High School, Alexia Forhan from Assabet Valley Regional Technical High School in Marlborough and Robert Gilmore from Stacy Middle School in Milford. “Raytheon’s profound commitment to STEM education serves as an inspiration to us and we could not ask for a better partner in our efforts to promote STEM and impact students,” Morry said. Powers has introduced several new programs to her school, including the GEMS Program (Girls Engaged in Math, Science and Computer Science), which involves high school seniors mentoring middle school girls in mobile app development. Additionally, she worked with a UMass-Lowell professor to write curriculum in robotics and Java with AR drones, which is now fully in place at AMSA and brought a NASCAR STEM initiative called the Ten80 Racing Challenge to the school. She also launched the Technovation Challenge program at AMSA. The program is a science-education non-profit that helps engineers, scientists and high-tech professionals bring cutting edge science, technology and engineering to high school girls and underprivileged minority children and their families. A team of students from AMSA recently developed a mobile phone application, which won the regional competition and finished third in at National Pitch Night in Santa Clara, Calif. Powers, who is co-president of the Computer Science Teachers Association and founder of the Boston chapter, has previously been recognized with the National Center for Women in Technology (NCWIT) Aspirations in Computing Educator Award and with the Massachusetts Technology Leadership Council (MTLC) Technology Leadership Award. All full-time, active and certified K-12 classroom STEM teachers in a state-accredited Massachusetts public or private school were eligible for the 2013 STEM Teacher of the Year Award. Nominations were submitted by someone with direct knowledge of the teacher’s impact in his or her school. A committee comprised of STEM professionals and staff from The Hall, the Massachusetts Department of Higher Education and Raytheon selected five finalists who were interviewed individually by the committee before it selected the STEM Teacher of the Year. Nomination applications for the 2013-2014 STEM Teacher of the Year are now available at www.thehallatpatriotplace.com. The Hall at Patriot Place presented by Raytheon is the crown jewel of Patriot Place and the only sports and education experience of its kind. Through a dazzling array of interactive multimedia exhibits and artifacts never before viewable by the public, The Hall showcases the tradition of the New England Patriots, explores the history of football in New England, and promotes math and science education for thousands of schoolchildren each year. The Hall received a Gold MUSE Award from the American Association of Museums and The Hall’s signature film, “Patriots Way,” won a CINE Golden Eagle Award. The Hall was named to Boston Globe Magazine’s Best of the New, and was a Yankee magazine Editor’s Choice recommendation. Tickets to The Hall are $10 for adults, $7 for seniors and $5 for children 5-12. Children 4 and under are admitted for free. The current hours of operation are 10 a.m. to 5 p.m. from Monday to Friday, 10 a.m. to 9 p.m. on Saturday and 10 a.m. to 7 p.m. on Sunday. For more information or to purchase tickets, please visit TheHallatPatriotPlace.com, visit “The Hall at Patriot Place presented by Raytheon” on Facebook or follow @TheHall on Twitter.